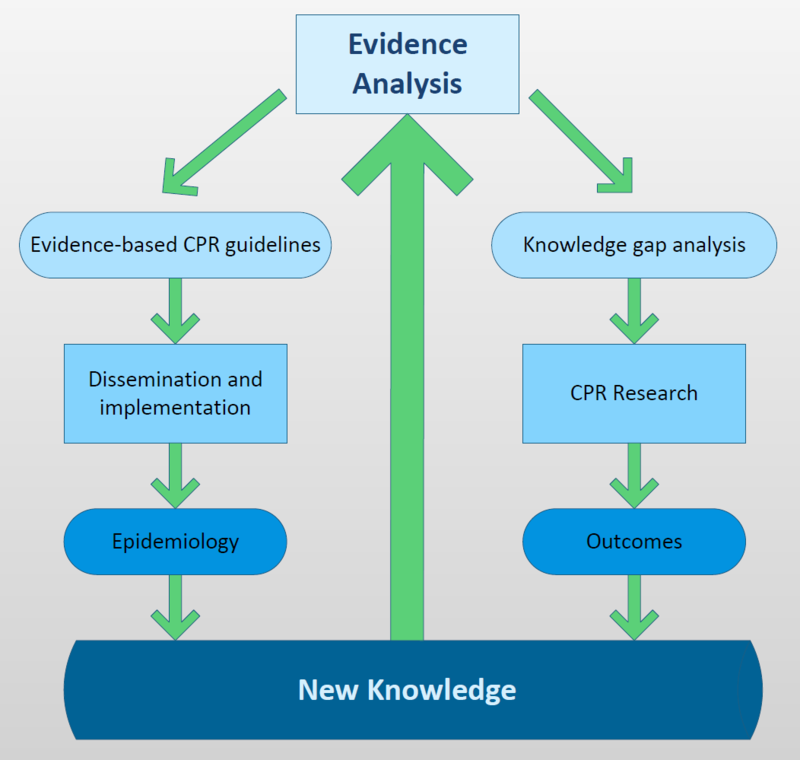 The first RECOVER CPR evidence evaluation revealed a large number of knowledge gaps: these gaps limited the quality and strength of the recommendations made in the 2012 RECOVER CPR guidelines. An integral part of the systematic literature reviewing process employed by RECOVER is, therefore, to identify knowledge gaps and to facilitate research to generate new knowledge to address these gaps. Such knowledge, in turn, will grow our understanding of how to best conduct CPR in veterinary patients and will improve future CPR treatment recommendations. Implementation of treatment recommendations in clinical practice is essential for a positive impact. RECOVER undertakes a passive (free-access publication of guidelines and translation in several languages) and active (online and in-person training framework, including competency assessment) dissemination strategy to improve implementation in practice. Epidemiological studies are required to identify whether the translation of the RECOVER guidelines into a clinical practice occurred to a satisfactory degree and what benefits of clinical implementation emerges for veterinary patients with cardiopulmonary arrest. Findings from such studies are expected to help devise optimized and targeted dissemination and training vehicles, and may inform improvements in the area of learning and teaching. Identification and prioritizing of knowledge gaps. Provision of unambiguous operational definitions and data reporting templates to be used in clinical veterinary CPR research. Generation of a CPR case-report form for collection of clinical CPR data. Establishment and operation of a CPR registry. Coordinative support for prospective multicentre CPR studies. Numerous knowledge gaps emerged from the 2012 systematic literature review. The RECOVER Research Committee is collating these knowledge gaps in a separate document and is prioritizing them according to perceived impact on critical outcomes based on expert consensus. The aim of this is to provide a rational for veterinary resuscitation researchers to coordinate their research and to take a systematic approach to applying resources towards addressing high-priority knowledge gaps first. A common CPR terminology is critically important for efficient communication amongst resuscitation researchers and for undertaking collaborative studies. Unambiguous operational definitions for terms used in veterinary CPR research studies (and really any research studies) are a prerequisite for the collection of high-quality data. In 2013, the RECOVER initiative brought together an international group of veterinary emergency and critical care experts, including representatives of the veterinary critical care organizations VECCS, ACVECC, EVECCS, LAVECCS and JSVAS and the International Liaison Committee on Resuscitation (ILCOR). During a 3-day retreat and by standard consensus finding methodology, this group developed guidelines for uniform reporting of small animal in-hospital CPR events. The finalized consensus guidelines, the so-called Utstein-style guidelines on standardized reporting of CPR events in dogs and cats, were published in 2016 in the Journal of Veterinary Emergency and Critical Care. The document contains an explicit list of definitions for veterinary CPR terminology. It also proposes key data elements to be included in clinical veterinary CPR studies and in research reports. It is the hope of the RECOVER initiative that these guidelines serve as an effective instrument to elevate the quality of small CPR research, to allow data comparison across studies and to foster collaborative research. A clear veterinary data collection framework is also the pre-condition for establishing long-term CPR data repository projects (i.e., CPR registry). Given the unexpected nature of cardiopulmonary arrest, the collection of high-quality clinical data on resuscitation events is challenging. In the absence of technology to facilitate the real-time collection of data, most veterinary CPR research depends on manually recording clinical CPR event details on an electronic or paper case report form. RECOVER recognized that the design of this CPR case report form (CRF) can be instrumental in improving data collection or for enrolment of CPR cases in studies altogether. A CPR CRF task force was therefore brought to life in late 2017 and was chartered with developing a user-friendly CRF that improves collection of CPR variables of core importance as per the Utstein-style guidelines. Reliable collection of these data is crucial for a meaningful interpretation of CPR events. A registry is a health-related database containing demographic and clinical information of individual animals and serving a specific health-related purpose. Registries are used for long-term data collection, while observational research projects focus on short-term data gathering. The RECOVER Registry Committee is chartered to develop and maintain the RECOVER CPR Registry. It is currently testing the registry in a small number of veterinary hospitals, prior to placing a call for registry contributors. Conducting prospective clinical studies involving CPR is complicated by the unexpected nature of cardiopulmonary arrest and by the low number of animals that survive to be assessed for functional outcome. A single veterinary center is therefore unlikely to generate adequately powered clinical trials in a meaningful time frame and multicenter studies are a pre-condition for interventional (and probably observational) studies of acceptable quality. RECOVER therefore strongly encourages that investigators collaborate with multiple groups to answer their research questions. The RECOVER Research group aims to support the process by providing study design support and access to electronic data collection instruments. A RECOVER Trials Committee is now being formed to help to coordinate multicenter CPR studies. Lack of funding constitutes a significant impediment to any clinical research in veterinary medicine and CPR research is unfortunately no exception. RECOVER aims to generate funding to support CPR research in a competitive manner. The RECOVER Trials Committee is appointed to explore funding options for this purpose and, once available, to administer the allocation of CPR research support via a grant application process.